Let us help you get in the Christmas Mood with the Bo Bunny Blog Challenge using the fabulous Bo Bunny Elf Magic Collection. Head on over to the Bo Bunny Blog to see more details. We know you need to get this bundle quick, so we are offering Free Expedited Shipping with a $20 or more purchase of the Elf Magic Collection. Just use coupon code ELFMAGICFAST through November 20th. No need to worry if you are a FotoBella Bo Bunny I Want It All! Member, your Bundle is automatically shipped to you. 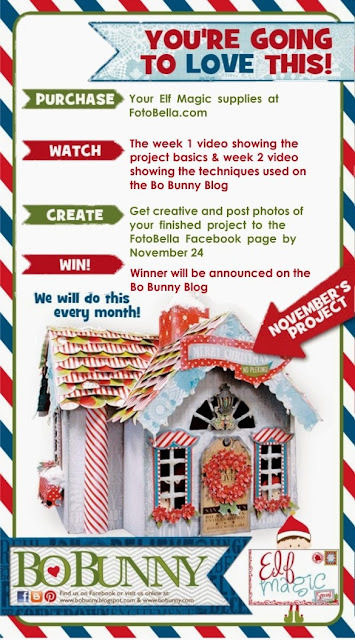 Become a member today to get a great monthly scrapbooking kits shipped to you each month and you will be ready for next month's Bo Bunny Challenge!